MonkeyMedia Software is my 9th Business Venture. I come from a long line of entrepreneurs; some more successful than others. Always working on the design of my companies. Always trying to be remarkable, somehow, some way, even on the days when I might be feeling like a fake. Feeling like a fake you ask? Of course! You think us entrepreneurs always know where we are headed? No way. Always trying to service my customers. Always trying to find a way to differentiate, to compete. I spend so much of my time just dreaming. Dreaming! For those of you that know me well, I often get so far ahead of myself. These days, I dream a lot of how our multi-unit restaurant community will embrace catering in the next decade. I am certain of it. I am seeing it more and more, day by day. Especially here in North America where markets are competitive, and consumers are screaming loudly at all of our operators to provide more services. I read a lot. I write a lot. I scour the internet for good material to help me grow my businesses. It’s ironic that I ended up in the consulting, education and software business. Or Is it? After all, as an entrepreneur I am always trying to grow my businesses. You can only do that if you work on your systems. Your belief systems, your sales systems, your service systems, your business systems…. It’s all just a set of subsystems, leading into one giant turnkey system. At least, that’s the way out for most of us. We need to build it to grow it, or we just get stuck in it. So many of us work “in” our businesses and we just have a hell of a time working “on” our businesses. I know, you’ve heard it before, but I found this great video by Michael Gerber, Author of the E-Myth that I think really speaks volumes to this conversation. After watching this inspiring speech, I dug further. Further into our restaurant industry leaders. Just a couple of them; ones that we all know. And boy, did they suffer in their humble beginnings. Here is a small tidbit on Ray Kroc’s early business “surprises”. I love the way he almost went broke at the beginning. Why? Because I have been there myself on more than one occasion. And so, I continue down my path of trying to learn more about the early days of the food business. 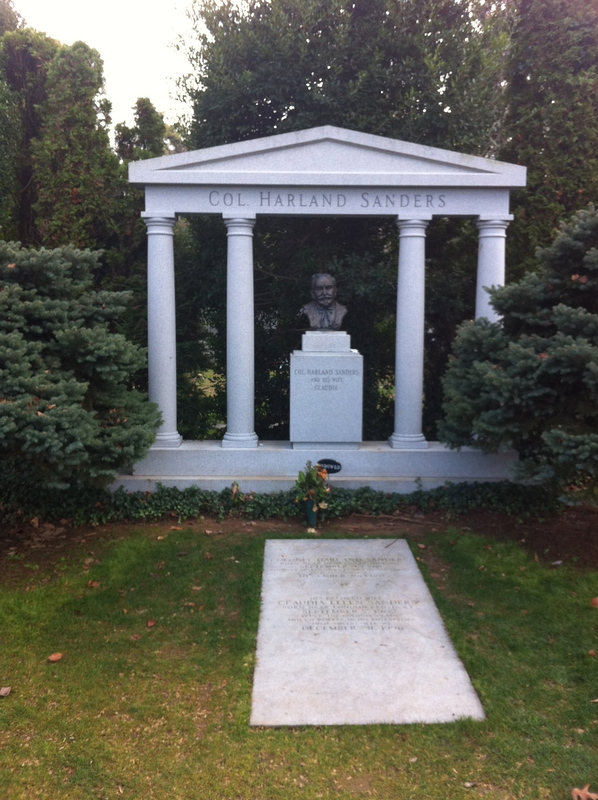 I was recently in Kentucky, and I felt that I had to visit the grave of Harlan Sanders. I’m not sure why, but I just felt compelled to pay my respects; So I went. Here’s a photo of my visit. It was interesting to see that others have been to this gravesite. And to pay their respects, if you look closely at the photo, you will see that fans actually leave Heinz Ketchup Packages organized in a row on his tombstone. Heinz ketchup packages? I wasn’t sure what to think at first, but then I realized that when you are part of pop culture, you influence young people too. I started thinking more about what it must have been like in the early days of these entrepreneurs. How did they get up each and every day and fight the battles they needed to fight to get through. Well, they just did. They didn’t think about it that hard. They just did what comes natural to them. What they thought was right. Were they always on track? Were they always correct? No. Certainly not. But no matter. This video reminds me to never give up. It just doesn’t matter what the competition is doing. It only matters that you just keep going. Pick a direction and keep going. It might not be the right direction, but that’s ok. At least you picked one. In the end, for me, it always comes down to the leadership. It’s about being firm. It’s about being clear. It’s about finding people that are smarter than you to work with you. It’s about being fair. It’s about being kind. It’s about being generous. It has everything to do with the people you surround yourself with. If Ray Kroc and Harlan Sanders were alive today, I would be trying my hardest to show them just how catering, and following my “turnkey system” of strategy, education and software can change their modern day business. I know what you are thinking. “Erle, if you are so sure, why don’t you just call up the current leaders of today’s brands?”. Well, I have been and I will continue to do so. Many are listening, and many are working with me. Experiencing success with these turnkey systems. So, as the world turns tomorrow, I am building my business to grow! What about you? Focus on what’s right in front of you and just keep going. Thanks for the message Lon. I am sure If we (I) had a chance to have this same discussion with Mr. Marriott, he would concur. Thanks for taking the time to read my post. All of a sudden, I am feeling very thirsty this morning! It was good to read your Blog today. It seemed that it was written with only me in mind. You see today my first day of taking over a new business, in Vancouver. Frankly, I feel a little overwhelmed with the task ahead of me. The only reason I decided to “go” for this new venture was that I saw that this business has the potential to be my “prototype”. I have always admired Ray Kroc, Col Sanders, Poulos Brothers, and other legends in this industry. 20 years ago, I met Michael Gerber, read the E Myth a dozen times, but still find myself doing it, doing it, and doing it ! It was timely to have your reminder, to get working “on” it. We know this stuff, but get caught up in the default of our comfort zone. Knowing what the business could look like and working backwards achieving that vision, is what will really change the game. Wow! Hi David. For the folks that don’t know David, he is my ex-business partner from Tony’s Deli and Catering Company! If not for David, I would not be doing what I do today. We learned so much together. David, I think I heard that you purchased a new business in retail for natural dog food? I will stop by and see you. So proud of you to start yet another venture. That sick feeling in your stomach is the right feeling! Winner never quits, Quitter never wins. Great stuff to read.